Finding an error in your teacher's work...what to do? In her entry on hymn #22, Karen Davidson quotes a scripture as the core message of this hymn. The text of hymn #22 portrays this scripture beautifully. And it goes on to discuss priesthood keys, general conference, and how it all helps us hold onto the iron rod. The only bit about the text that is slightly out of place is the "iron rod" moment at the end of the first verse. The poet breaks her pattern of strong and week syllables. She's been going along in perfect symmetry with weak-strong-weak-strong-weak-strong-weak-strong for 8 syllables followed by weak-strong-weak-strong-weak-strong for 6 syllables. This is the standard Common Meter, 8 6 8 6 with a series of weak and strong beats. But in the last line of the 1st verse, the final 6 syllables STARTS with a strong syllable placing the weak syllable on a downbeat musically. I tried to come up with a nice alternative to replace "marked by." Something that's 2 syllables long, starting with a weak syllable and ending with a strong syllable. Like the word "Be-hold," but that's obviously not what we're looking for here. Hmm, how about "and HOLD." That could work. It changes the sentence a bit. that MEN might LEARN to FIND the PATH, and HOLD the I - ron ROD. that MEN might LEARN to FIND the PATH, that LEADS us BACK to GOD. I'm not a poet. But when I'm working with my poet/librettist friend Phyllis, who I write hymns and cantatas with, we talk about this kind of stuff all the time. There's always a way around it. It takes some extra effort. Sometimes a TON of extra effort. But doesn't our worship music deserve that extra effort? There are some excellent examples of clever voice leading in this hymn. Darwin Wolford, the composer, was my first composition teacher. Back when I was an undergraduate student at BYU-Idaho, I spent many hours helping Darwin enter his Oratorio into Finale software so the school would be able to mount a performance of the piece. Almost every day we spent time together talking about the great standard repertoire. I learned a TON from Darwin. He had studied with Pulitzer Prize winner Ned Rorem as well as with Alexander Schriner and Leroy Robertson, 2 fantastic LDS composers that are too often forgotten nowadays. I owe a great deal to Darwin. He taught me SO much and gave me a solid footing that helped me as I went on to grad school. That's why finding a big voice leading error in his hymn has thrown me for a loop. What to do? I don't want to be the nay-saying, fault-finding, brat-like former student. Not at all. I've decided to go ahead and call it out in an effort to be consistent and to offer assistance to other hymn writers. It's important to realize that even pro's make mistakes. I found an illegal Parallel 5th in Mozart once. What do you do with that? 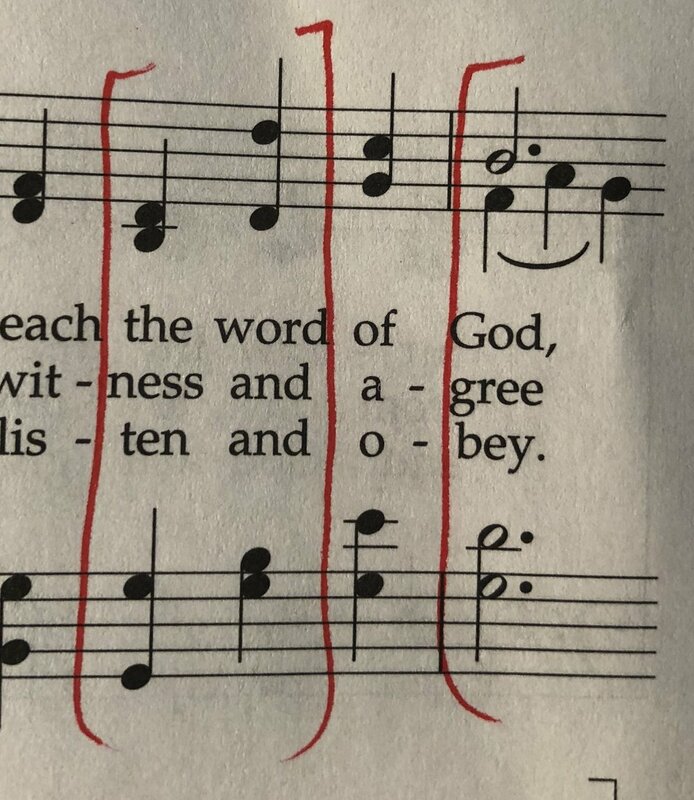 Before we discuss the error, let's look at how he used voice leading in several excellent ways to both avoid errors and keep the hymn interesting. The tune itself is pretty standard. Lines 1 and 2 are nearly identical, which is very common. They end slightly differently to give each cadence a distinct feeling. The melody in lines 3 and 4 make use of the rising scale towards a climax by emphasizing first the A (on the word "chosen"), then a few bars later landing on an important chord a step higher on B (on the word "God"), and then hitting the climax spot on a high C at the beginning of line 4 (on the word "men"). So, over a 5 bar phrase, we basically hear A rising to B, rising to high C. Extremely effective melodic gravitational pull to the high Do, the high C.
Right away in the 2nd full bar, there is what looks like an illegal Parallel 5th in the soprano and alto. But it's a Perfect 5th going to a Diminished 5th. So, no issues. That's allowed. It occurs again in the 2nd line. No problem. The first cadence is really nice. Rather than pausing on a 5 chord in typical practice, the tenor voice keeps the momentum moving forward for 3 beats and the bass steps down to the F on beat 4 after the leap up to the G. So Lines 1 and 2 feel much more like a natural continuation of 1 stream of thought. I like these kinds of "bridge cadences" constructed out of moving voices. Bach does this kind of thing often. Line 3 has a potential problem, but it's handled expertly. On the word "his" we have a doubled leading tone. This is usually a big problem because it causes parallel octaves. The leading tone, for those unfamiliar, is the 7th scale degree. In this key, C major, the 7th note in the scale is B. And the 7th note in any scale really, really wants to resolve to the 8th note, the tonic. So if you double that note, as has been done on this chord (soprano and tenor), they both want to resolve up to Do, the C. But that's parallel octaves. Professor Kirchenbank would hyperventilate and pass out. The chord in question is a 3 chord. Not the most common chord, which is nice. It brings a different flavor into the hymn. So, how does Dr. Wolford avoid the parallel octave? He uses contrary motion. Follow the soprano voice starting right before the B. It steps down from the C to the B, and then steps down again to the A. The tenor does the exact opposite. It starts on an A, steps up to the doubled B, then steps up again to C. Beautiful contrary motion to avoid an illegal parallel. Later on the same line, on the words "the word," there's another moment where we could scratch our heads and think, "is that an error?" Have a look at the soprano. It leaps from D up an octave to another D. Now look at the bass. It does the same thing, but on a G. A D above a G is a perfect 5th. And, they move in the exact same motion, leaping up an octave. Isn't that an illegal Parallel 5th? In this case, no. It's the same chord. It's a root position 5 chord, a G chord. Because it's the exact same chord, only re-voiced in a higher register, there's really no perceived motion. So, I have no problems with this at all. Totally fine. We get another lovely "bridge cadence" at the end of line 3 that leads us to the most interesting harmonic passage of the piece. As the text depicts, we're trying to "find the path." So the harmony does its job well in taking us on a little back alley path towards finding the final cadence. The best moment is the fermata with that C-natural in the alto. Because there was a soft resolution at the beginning of that bar by means of the chord with the C-sharp in the bass, removing the C-sharp so soon sort of pulls the rug out from under us. We're unsteady. "Wait, are we on the right path? Are we in the right key?" Then there's a quick return to the gravity of the 5 chord in C major, the G chord that precedes the final C chord. It's that F-sharp in the tenor after then fermata and the A in the bass. They step outwards to a C chord with a G in the bass and now our ear realizes it IS in fact on the right path. Phew! But then the voice leading error slips in. A Parallel 5th between the Alto and Tenor on the word "the" and the "i-" of "i-ron." Dang! That's actually one that sticks out quite a bit. I can't NOT hear it. Sometimes, especially with more colorful harmony as we've been hearing in this passage, you can cover up the sound of a parallel 5th. Like if there's a 9th in the chord. That's almost always a Get-Out-Of-Parallel-5th-Jail Card. Hmm... Maybe this parallel is more text painting? Maybe it's like the mist of darkness that came around those who were holding the iron rod? Or, maybe it's a depiction of the fountain of filthy water? The filthy forbidden 5th water? I'm not sure. And I don't want to jump to any conclusions. Dr. Wolford is usually laser-precise with his harmony. I should call him up and ask him about this. I think I will. What I don't want to do is throw him under the bus. He must have had a good reason for this. Fixing it is a piece of cake. All you'd have to do is keep the alto on C for 3 beats instead of going down to the A. Problem solved. He must have had a good reason. Maybe because the bass line is a pedal G? Often a held out bass note gives license to get away with other things in the upper voices. Well, I don't have an answer. I'm curious to hear what you all think. And if I can get a hold of Dr. Wolford, I'll report back in the comments. I was too afraid to show this bit to Professor Kirchenbank. I didn't want to tarnish Dr. Wolford's reputation at all. I owe them both SO, SO, SO much! Ok, well, that's all for today. All in all, it's a fine hymn. I'm sad it's not more well known. I love the message and the music offers many clever moments. We'll see what the new hymnbook committee thinks. P.S. Click the button below to subscribe to these posts. And let me know what you think too. I'd love to hear your opinion. And if you think I'm wrong or crazy or cruel, that's ok, I'd love to discuss it with you. I am very proud to call Darwin Wolford my teacher and friend. I was one of his last organ students as he retired from Ricks College/BYU-Idaho in 2004. He had a long career as a teacher, composer, and was influential in the music of the church, serving for a lengthy period on the church music committee and on other music committees, including the 1985 Hymnal committee. Brother Wolford had (has) a passion for the hymns, so much so that he volunteered to teach a religion course on the hymns and doctrine at BYU-Idaho, an enlightening class that I enjoyed. I’m certain Doug will have much to say about Brother Wolford as well and the genesis of this hymn, so I will get to the practicalities. I think this hymn is most successfully sung around 112-116. I might register principal chorus to mixture, taking the mixture off for the second verse, and adding it back with maybe a chorus reed for the final verse. This is a good hymn to perhaps experiment with pedal points on the final verse. Newer PostWhat makes a melody sound reverent?